Sweet and spicy at first with vanilla and acacia honey. Hints of mushrooms - like taking a walk in the woods on an autumnal morning. Then oranges (not the juicy but more the overripe ones) and milk chocolate arrive, followed by toffee and spices - mainly oak and ginger. With time, notes of leather and tobacco (cigar box) emerge in the back. Wow - I wasn't expecting this intensity. Big, intense and rich. A lovely mix of spicy sweetness - acacia honey, cinnamon, caramel, vanilla and spiced oak. A big mouthfeel! Slightly bitter orange peel, tobacco notes and leather towards the finish. Very tasty! The finish is long, slightly warm, sweet and pleasantly spicy. Becomes drier towards the finish with fairly amounts of oak, leather, tobacco and cloves. Fresh on the nose with a few drops of water. Sweet toffee and vanilla with a tamed spiciness of acacia honey and oak. The lovely sweetness is significantly decreased on the palate together with a tamed spiciness. However, the single grain becomes fairly dry with oak, cloves and notes of cough syrup. The finish is still long and less warming with only a hint of creamy and sweet vanilla, followed by very dry notes of oak, cedarwood and cloves. 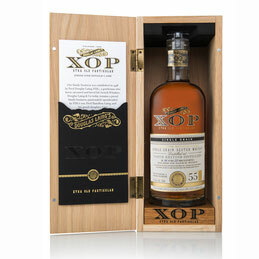 This single grain whisky has spent unbelievable 55 years in a single cask. A superb and high quality dram, not (too) overpowered by the wood (if no water is added!). A lot is going on here and the grain needs a fairly amount of time to develop its full aroma. Lovely nose and complex palate with a long and woody finish. Another brilliant example how great grain whisky can be.